The Georgian Fair took place at the Pockerley Waggonway, Beamish, over four days from the 2nd to the 4th June. Thousands of people came every day to enjoy a taste of life in Georgian England. The event was so popular that the gates were opened thirty minutes early because of the amount of people waiting to come into the museum. One family travelled from Bolton in Lancashire on the bus, a journey which took three and a half hours each way. The organisers took great care to ensure that everything at the fair was as authentic as possible. There was all the hustle and bustle that you would expect and visitors could see labourers working in the fields, traditional craftsmen at work, trinket sellers and entertainers performing various shows throughout the day. The fair was officially opened at 11am each day by Squire Pockerley who invited everyone to have a good time but added a warning that drunks, thieves, pickpockets and the like would be severely dealt with. Also that no trading was allowed outside of the boundaries of Pockerely. There were live performances by Random Mike the Fire Juggler, Svenson’s “Circus Minimus” Flea Circus, clog dancers, a Northumbrian Piper and Punch and Judy. There as something for everyone including Swing Boat rides, Coconut Shy, traditional games and costume try on. 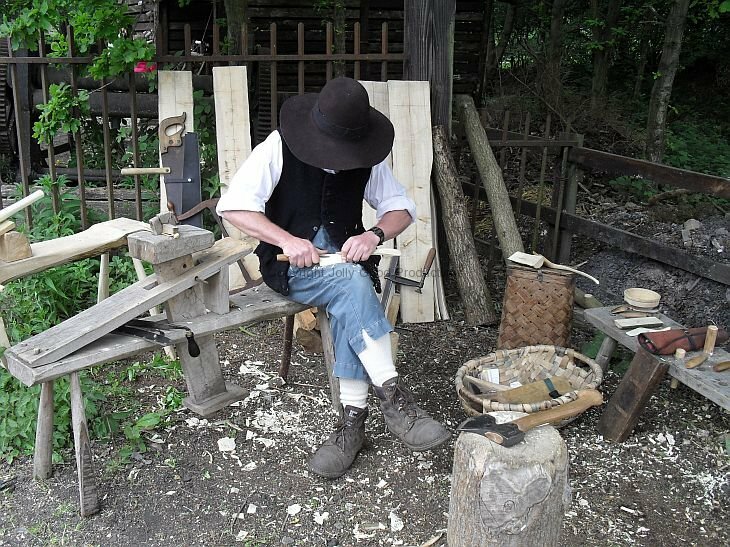 There were demonstrations of pole lathing, traditional woodcraft, cleft ash gate making and basket weaving. You could try your hand at making a lavender bag or sample gingerbread if you were feeling a little peckish. Fresh produce was for sale at very reasonable prices including bedding plants, perennials and herbs, fresh bread in all shapes, sizes and flavours, corn dollies, Beamish wine and hand made greetings cards. The Georgian Fair continues to go from strength to strength. I am certainly looking forward to next year and hoping I will be invite to participate with my Punch and Judy show again. Power from the Past is from 1st to 4th September. Beamish Agricultural Show is from 15th to 18th September. This entry was posted in event and tagged Beamish, Beamish Museum, Georgian Fair on June 11, 2011 by ronwooduk.